"The Kenya Budget did not touch on the Drought and Hunger Disaster," Said ODM Chairman John Mbadi. - Bana Kenya News, Real African Network Tubanane. Home Business featured "The Kenya Budget did not touch on the Drought and Hunger Disaster," Said ODM Chairman John Mbadi. 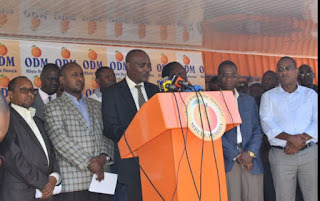 "The Kenya Budget did not touch on the Drought and Hunger Disaster," Said ODM Chairman John Mbadi. The ODM chairman John Mbadi rubbishes claims that the Budget read yesterday by the Treasury Cabinet secretary favour the common Mwananchi. The ODM official said that the budget did not touch anything in upgrading the life standards of the Common Person. According to the ODM team, the budget was only meant for the August polls as seconded by some economic analysts. The budget which will reduce the price of the flour for four months is not a good one for the people. " There are so many people die of hunger, drought has affected so many areas, Domestic animals are dying and so many negative and bad things for our country. There was no or little disaster management kit to fight those country diseases." Said Mbadi. The Dagorreti North Mp Paul Simba Arati said that the budget looked at the areas where they have not touched in terms of corruption. "For example, they have not yet eaten the gambling cash and they envy. Sportpesa have sponsored the Kenya Premier League, Mcheza has also sponsored the Nairobi and its environs teams. What is that the sports ministry will do if not now taking that money into their pockets? They finished the public funds' sector, now they have embarked on the private sector economy." Arati said. According to the citizens, the majority says that the Kenya budgets have been read since 2013 but nothing changes. Nothing will change from the shelves that the common Mwanachi will feel. The Kenyan trend is when things go up, the same night everything will change, when they go down nothing changes.